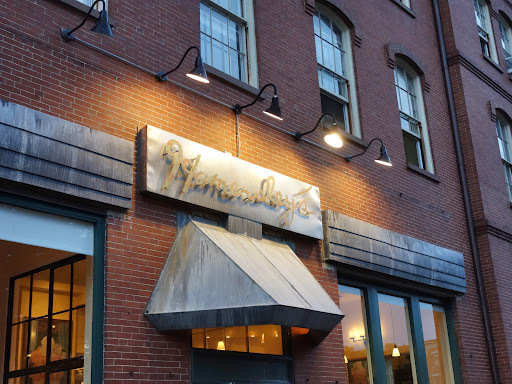 I have been to Hamersley’s Bistro in Boston’s South End four times. I remember every visit. If you read nothing else in this post, here’s the bottom line: I love this restaurant and I can’t recommend it enough. The lesson was lost on me at the time. I didn’t understand just how often upscale restaurants operate without their signature chef in the kitchen. I assumed that if a restaurant was advertising under a particular chef’s name, then that chef must be in the restaurant at least a few days every week, right? I hadn’t realized just how much this industry relies on pure branding. Now, I understand that many chefs own multiple restaurants and can’t be in three places at once, and if a chef chooses to make that trade-off then so be it. But I think it’s telling that the country’s (arguably) most successful chef-owner, Thomas Keller, maintains a live closed-circuit video link between the kitchens of his restaurants in New York and California. When the chef is in the kitchen to oversee the preparation of his food, it’s consistently a better dining experience for the customer. The exterior of Hamersley’s Bistro in Boston’s South End. My second experience at Hamersley’s was the first time I met my boyfriend’s mother. Without recapping my short and uninteresting dating history let me just say that I had positively zero experience with Meeting The Parents, so my boyfriend picked Hamersley’s because it offered a low-key atmosphere and I could distract my anxiety with good food. He was right on both counts. Moreover, what I couldn’t have known was that his mother would become one of my closest friends and most trusted foodie advisors, making Hamersley’s a fitting place for our introduction! My third meal at Hamersley’s consisted of an appetizer and two (2) desserts. Yes, you read that right. Our good-natured waitress didn’t blink, but said it was the first time she had ever seen anyone order that way. In my opinion the restaurant had invited it by including their dessert offerings on the dinner menu rather than telling us about dessert after we had eaten our entrees — too tempting for diners like myself who are already prone to indulging their sweet tooth! My appetizer was a goat cheese-and-beet “Napoleon” with sherry vinegar and hazelnuts. Dessert #1 was fritters with a raspberry-lemon compote and honey ice cream, and dessert #2 was a molten chocolate lava cake with raspberries and raspberry sorbet. I wasn’t blogging at the time and so I didn’t take notes on the dishes, I just dove in, but I remember thoroughly enjoying my meal and thinking that I’d order any of those again in a heartbeat. 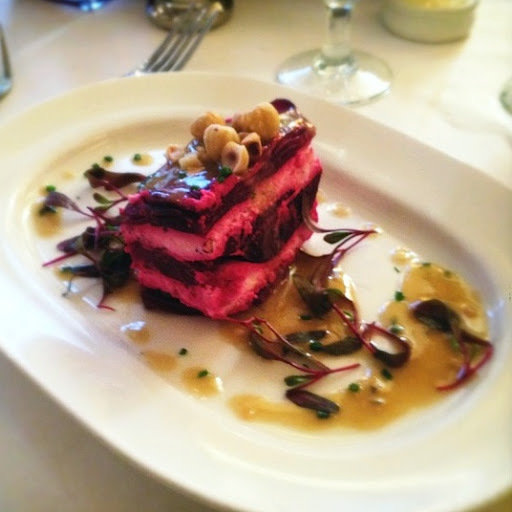 Goat cheese-and-beet “Napoleon” with sherry vinegar and hazelnuts. 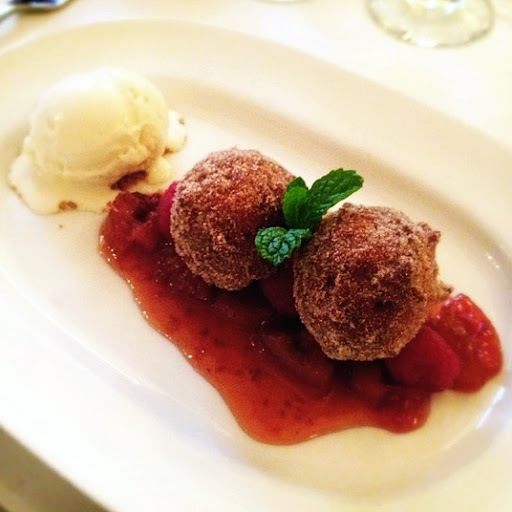 Fritters with a raspberry-lemon compote and honey ice cream. 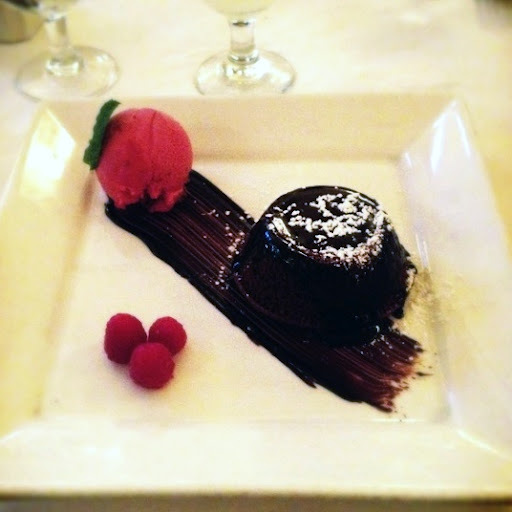 Molten chocolate lava cake with raspberries and raspberry sorbet. This brings me to my fourth and most recent experience at Hamersley’s, which carries a lot of significance to me and to this blog. For about a year prior to starting a food blog, I had dwelled on the pros and cons of doing it. There were complications. I had fallen in love with food and it had taken on an important role in my life for several reasons, and I wanted to share that. But shortly after I began the blog in early July 2012 — we’re talking three posts total — I decided that the complications outweighed any benefits and that I would abandon the project. Then on July 19, I woke up to an email notification that I had a new follower on Twitter: Gordon Hamersley (@ghamersley — note: his Twitter account is no longer active). I had done very little advertising for my blog and only tweeted a few times, so I didn’t expect that any well-known Boston chefs would see my Twitter, let alone follow me. What happened, I assume, is that my newly-created Twitter account popped up in Hamersley’s “Who To Follow” suggestions-sidebar; and seeing that I was a food blogger, he clicked “follow.” No big deal. But that email notification was enough to inspire me to keep writing my food blog. It might sound silly, but as a brand new and unestablished food blogger, the idea that Gordon Hamersley might be reading my Tweets and maybe even someday my blog posts was just about the coolest thing. By August I was preparing to move into my dorm at Northeastern University. This was going to be a challenge. I had received my associate’s degree in May and was excited to start at Northeastern, but at the same time this was a new experience and I was nervous. With my move-in date set for Sunday, September 2nd, my boyfriend suggested that we make a reservation at Hamersley’s for that evening. It was a short walk from my dorm, and he knew it would give me something to look forward to. Move-in day arrived and I was already frustrated by my dorm. Later I would discover that telling people which dorm I lived in invariably elicits one of two reactions, either “I didn’t know they had dorms there!” or “Sorry, hope you’re holding up okay.” The unofficial slogan for my dorm is, “We’re all in this together, at least until room changes become available.” Worse, it turns out that I was assigned literally the smallest of the forty rooms on my floor. Needless to say, by the end of move-in day I was in dire need of some good food to remind me that all good things flow into the city. So my boyfriend and I walked to Hamersley’s, sat down immediately, and I dug in. 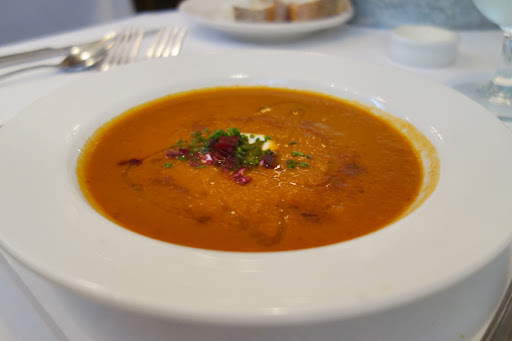 I began with an appetizer of spicy carrot soup with Greek yogurt, pickled beets, and cinnamon salt. The soup was cinnamon-flavorful spicy rather than need-a-sip-of-water spicy, which is exactly the amount I like. I could definitely taste the cinnamon flavor in the salt that had been lightly sprinkled over the top of the soup, while the pickled beets added a salty note of a different timbre. And the dollop of Greek yogurt in the middle of the bowl added contrast between flavors. I would definitely order this dish again! Spicy carrot soup with Greek yogurt, pickled beets, and cinnamon salt. I could write an entirely separate a post about our entrees that night, and we didn’t even order different things. Both my boyfriend and I ordered the same, Hamersley’s roast chicken with garlic, lemon, and parsley. I needed to try this chicken. On this occasion my boyfriend was disappointed to learn that Hamersley’s “garlicky mashed potato cake” side dish was gone from the menu, because he always ordered it alongside his roast chicken. It had been replaced with roasted potatoes with rosemary and sage, so we ordered those instead. Hamersley’s roast chicken does come with a potato wedge, but it isn’t sufficient for the entire chicken. That is the only size-related shortcoming of this dish. The two plates of the chicken arrived and I took photos for what seemed an impossibly long few minutes, and then I composed a bite of chicken, potato, garlic, and onion. I balanced every ingredient on my fork. Before I tasted it, my boyfriend told me that I have permission to like Hamersley’s roast chicken more than his own. I taste. I understand. I love. So. What makes Hamersley’s roast chicken so good? Well, it’s a Boston legend so I feel a little silly trying to explain why it’s good. “Because it’s Hamersley’s roast chicken.” But I decided to become a food blogger, so I’ll give it my very best shot. Hamersley’s roast chicken is cooked to perfection. Think of the most tender, fall-off-the-bone chicken you’ve ever had. Do you have the memory firmly in your mind? Good. Now forget about it and come to Hamersley’s, because this is where roast chicken is at. The chicken is permeated by the most heavenly taste of lemon-y, garlic-y flavors that a human being can achieve without use of psychedelic drugs. There are roasted onions and garlic on the side, except there isn’t really any such thing as “on the side” in this wonderful plate of flavors. I cut up the cooked lemon slices, rind and all, into tiny pieces to add some extra zest to my bites. As I hinted above and hopefully you can see in my photo, Hamersley’s portion of roast chicken is generous. It’s an entire half-chicken. This is good, because nothing is worse than running out of perfectly roasted chicken. My boyfriend finished his, but I only managed about two-thirds and didn’t have room for dessert. (!!!) Over the summer we tried another restaurant’s roast chicken after my boyfriend read that someone had compared it to Hamersley’s, and before even tasting it he confirmed his skepticism as the plate arrived at the table with a portion about half the size of Hamersley’s. I’m telling you, Gordon Hamersley has set the standard for roast chicken. So now you’re thinking, “If Hamersley’s roast chicken is really that good, then I should get the recipe so I can make it at home.” Don’t worry, I’m like five steps ahead of you. The recipe appears in Gordon Hamersley’s Bistro Cooking at Home cookbook, which also includes two other versions of roast chicken. If you don’t have Gordon Hamersley’s cookbook on your shelf, you should fix that as soon as possible. If you buy it at the restaurant, you’ll get one autographed. That being said, Hamersley’s chicken as served in his restaurant is notoriously difficult to recreate at home. My boyfriend’s mother did it once and ended up calling the restaurant with a question, and in an impressive and yet typical-for-Hamersley’s display of customer service, the host who answered the phone walked to the kitchen and relayed the question to Gordon Hamersley who happily answered. The bottom line is that it’s a dish that takes a lot of preparation and is best suited for a full kitchen staff. It isn’t a casual recipe. That’s part of why it’s worth paying for. We left Hamersley’s that night and walked back to my dorm. The return trip always seems to go by faster. I thought about the cramped little room that I would be living in for the next four months, but then it occurred to me. “I am within walking distance of all this fantastic food. I can do this.” That meal made my day on what should have been a very difficult day. And I have been doing great at college since. Now obviously, I am not objective about Hamersley’s Bistro. 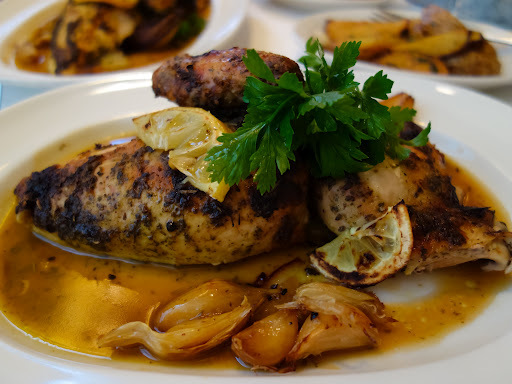 His chicken inspired my boyfriend to develop our at-home version of roast chicken, which is one of my all-time favorite meals. Hamersley’s was the first meal I ate as a resident of Boston, a city that suddenly felt a lot bigger and more confusing when I couldn’t go home. And if I hadn’t awoken to an email notification that Gordon Hamersley had followed me on Twitter, I don’t think I would have a food blog right now. But sentimental attachment is good. That’s what a dining experience should be: diners connecting with food. Years from now, I will remember my meals at Hamersley’s Bistro. I hope you have the opportunity to dine there and create lasting memories of your own. Hamersley’s Bistro closed at the end of October 2014. For my 22nd birthday in October, my boyfriend and I visited Hamersley’s for one last time. The chicken was every bit as good as I had remembered. I’m sad to lose one of Boston’s best comfort food dishes and consistently excellent restaurants, but hope that Gordon and Fiona Hamersley enjoy their well-deserved retirement. SO I came across this post while googling about the chicken at Hamersley’s. I’m from Boston originally, but I live in DC now and I had a VERY sad phone call last night from the man who first introduced me to Hamersley’s: They are closing. I have been there countless times, and I think 98% of those times I have had the chicken. Every time I think; no no. I’ll get something different this time. But then I enter and I smell. I have to have it. I rationalize it, which is easy since I don’t live in Boston anymore. “Maybe this is the last time I’ll be here, so I have to have the chicken.” So, after the conversation last night, I am booking a ticket to Boston for September to have that amazing chicken one last time. Food in DC isn’t that great, and there is no use in comparing roast chicken here to Hamersley’s. You summed it up perfectly, and I hope you get in as many visits as possible before they close in October. This is the saddest news I’ve heard in a while.